The Tournament of Nations is back for a 2nd incarnation this year, with two games each on Thursday July 26th, Sunday July 29th and Thursday August 2nd. The United States Women's National Team hosts the senior squads from Australia, Brazil and Japan as they all begin to turn one eye to France and the 2019 FIFA Women's World Cup. Winning the tournament is always a plus, and it gives the winner some bragging rights, but the most important part of this tournament will be finding out if players are going to be serious contenders for the World Cup roster next year. And among the ToN sides, the USWNT may be the team with the most questions. There have been injuries that have lingered. There have been players who haven't developed in certain positions with their club sides. There have been others who simply haven't had the opportunity to play consistently. But the time has arrived to start to solidify the standing of the core of the team. Who will fight for the right to (PAAAAAAAAARRRRRTTTAAAYYY) go to France next summer? It's time to find out. We invited a few little helpers to announce our #ToN2018 squad. Fun times: There's a live stream! BREAKING NEWS@TheMatildas #ToN2018 opener will be live streamed on the My Football Live app. Otherwise, there are likely to be lots of people on twitter looking for live stream links at game time. Try not to give any of those links your credit card information and you should be OK. This match (and the other two USWNT ToN matches) will be televised in the USA on FS1. Brazil and Australia sit 7th and 8th in the current FIFA rankings, respectively. Japan, interestingly, is 6th. So there's presumably a lot of parity across these very different squads. That's not to say that they match up well against each other. These four sides play dramatically different styles and it's going to come down to who is able to neutralize their opponent's tendencies the best to grab a win. In the early match, you've got Brazil and Australia. Both sides play a fairly open style with a desire to connect the dots through the thirds with good passing. Both sides will also abandon the passing if it's not working in favor of more direct diagonal or over-the-top long balls to find their talented finishers. Based on recent results and in-form players, I'm giving Australia the edge over their fellow southern-hemisphere rivals. Australia 3-1 Brazil. USA v Japan is always a tough slog. Well, except for on one memorable occasion round about three years ago. It's worth remembering that after conceding FOUR goals inside the first 16 minutes in the 2015 FIFA Women's World Cup final, Japan did pull one back and force an own goal before ultimately losing 5-2. Japan wants to dominate possession, and the uncertainty at outside back for the USA may give them plenty of chances to send crosses toward the box. However, the physical size advantage for the hosts can't be overlooked. That should be enough to keep those crosses from reaching their targets. It should also be a huge advantage in getting to crosses heading toward's Japan's goal. USA wins this one early. USA 4-2 Japan. Her Pitch will be at both matches on Sunday, and I've got some fun to share from Saturday's media availability. 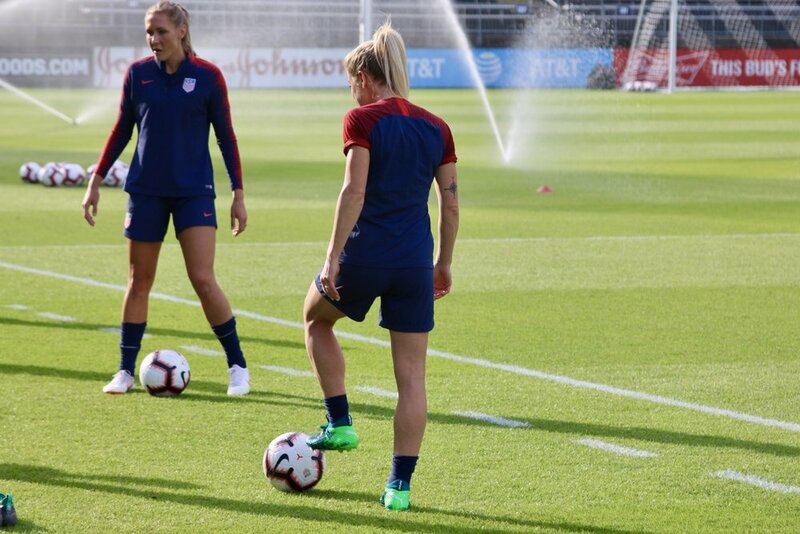 All four teams had a brief practice at Pratt & Whitney Stadium at Rentschler Field on Saturday, though the only press conference available was with USWNT Head Coach Jill Ellis. There are several interesting pieces of information in here, including her decision to start Alyssa Naeher for all three matches of the ToN. Towards the end, Ellis shares her thoughts on what led to calling up and then subsequently cutting Jaelene Hinkle. Other topics: Rapinoe's leadership, what's in a midfielder?, Australia's style of play, time limits for certain players, Kelley O'Hara's status and more! Both Brazil and Japan need to improve on their performance from Thursday to stay alive in this tournament. Neither was especially effective in their first contest, which was a bit surprising due to the depth of quality on both sides. Of the two, I think Japan actually put together more sustained runs of play, looking dangerous and refusing to roll over even while the USWNT started tinkering with the bench later on in the match. Brazil showed a bit of willingness to play to Christina Unkel's strength (if it can be called a strength) of getting suckered on flailing wildly on innocuous tackles. Australia made some obvious strategic fouls, but the dramatic flopping earned the Matildas probably two yellow cards too many on the night. Japan's not going to be as physical as Australia, so there shouldn't be quite the same opportunity to earn set pieces on marginal contact. UPDATE: I was so close to getting this one very wrong, but they pulled it off for me at the end. Brazil 2-1 Japan it was! The nightcap will be very interesting. Australia has shown no fear against the USWNT, and has a ton of talent at every position. Fitness may be a slight concern for a few players, but speedy outside players and Kerr's ability to find space underneath is going to challenge the US backline perhaps unlike any other opponent. Emily Van Egmond and Alannah Kennedy do so much dirty work for this squad and depending on who is deployed in the American midfield, it could be one of those matches where the run of play takes quite some time to develop a rhythm. I'm torn. I can see both sides going for it. Australia's lineup has speed outside and physicality inside. They'll look to dominate the midfield and spring Kerr and Raso with Carpenter scooting around the outside of Dunn. Dunn and Brian on the same side might be a concern if Brian can't break up play in the midfield. Sauerbrunn's return will provide some welcome stability, but Kerr is so tough to track and the US back line will need to be at their best. Ultimately, I think it's a US win. Sam Kerr will get her chances and at least one goal, but it's not enough. I'm going out on a limb and calling for two PKs in this match. That way, there's no way I'll get everything right again. Or will I? USA 3-2 Australia. Nope nope nope. USA 1-1 Australia. Now things get interesting. So we're back with all the bragging rights on the line. 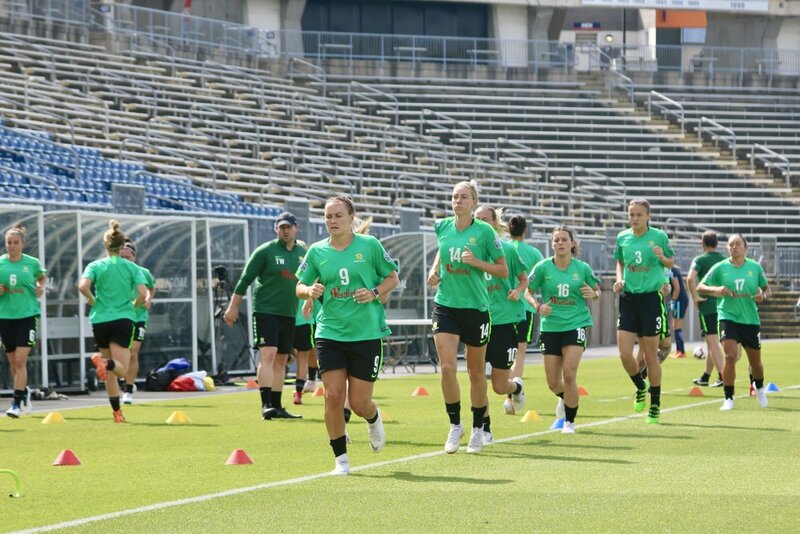 Australia and the United States, courtesy of their 1-1 draw in East Hartford on Sunday, are tied in the standings with four points, and Brazil is sitting on three. Japan can't earn more than 3 points, so they can't win. Otherwise, the results tonight will determine the winner. US Soccer covers all the bases on this, so go on over there and nerd out on the tiebreakers. Who's going to win #ToN2018 ??? It's probably going to come down to the tiebreakers, but it won't be Japan. Sorry Japan. The early match (5:45PM Eastern on Ye Olde USSoccer Website) features an Australian side that will want to defend their title vs the Japan side that hasn't collected a point across the first two days of the tournament. The US was able to push Japan around, despite giving up stretches of possession where Japan passed the ball well and made some good runs into the box. Stylistically, the teams couldn't be more different, with the Japanese squad favoring a highly organized and technical passing and the Aussies pressing and countering with athleticism and physicality. Both styles are attractive to watch at times, though the Japanese precision, one-touch passing and sneaky runs looks a lot better much of the time. The problem is, it's not been effectively lately against physical sides like the US and Australia. I don't think that changes tonight. Australia wins and puts the pressure on the USA to match them on points. Australia 3-1 Japan. So, will the USA rise and conquer, now that they know what will be required to take the trophy away from Australia? (8:30PM Eastern on FS1) They've got a much tougher test facing them in Brazil. Marta leads a side that has improved through their matches, and not just because of the quality of the opponent. They didn't have to be physical on Sunday, but they certainly aren't afraid to make hard challenges and earn fouls on questionable contact. The USWNT will need to move the ball quickly to stay out of the traps that the Brazilian midfield sets. How well they do that will be a function of the personnel who start for the hosts. 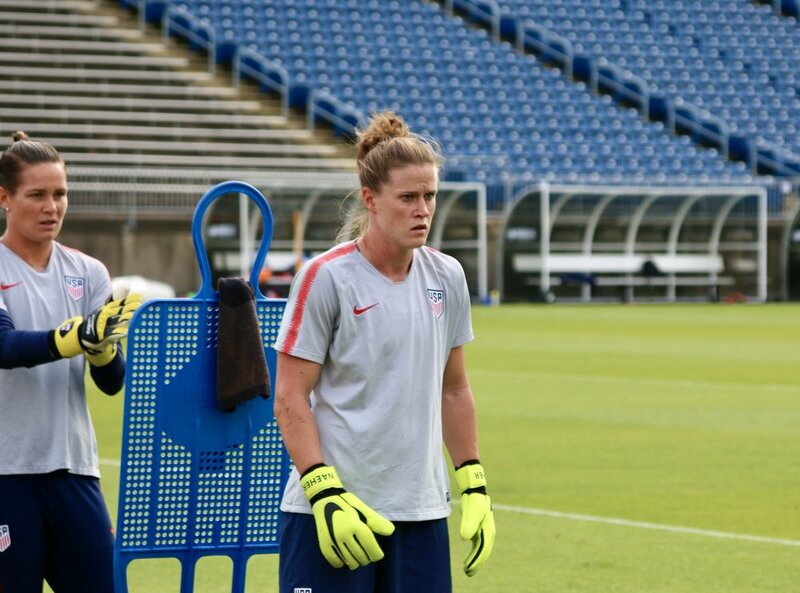 No guesses there, though we know Alyssa Naeher's name was the first one on the team sheet for each of the three games. I like the USA to win, but I'm not sure they win and eclipse what Australia will be able to do with Japan. It feels like a 2nd place tournament finish for the USWNT, which will hopefully provide all the motivation they'll need to pull together and go into WWC qualifiers on a mission. But maybe Sunday's comeback draw will have given them just the boost they need. Maybe they'll score in the first minute and roll up a scoreline to declare to the world that nobody else will be taking the WWC next summer, thank you very much. Maybe. Here's hoping. But I'm going with USA 2-1 Brazil.